Perfectly spotlight with a rare 4º beam, at an affordable price. 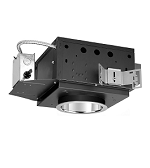 Our recessed, track mounted, and surface-mounted fixtures are compatible with a Philips or Soraa retrofit AR111 LED lamps, delivering a super narrow 4° spot, as well as a 8°, 9°, or 25° beam. Compared to luminaires powered by integral LEDs, these fixtures are more affordable, even when factoring in the cost of the retrofit LED lamp. Like all Edison Price Lighting products, 'Made in USA' durability and easy serviceability extend performance lifetime, making these fixtures an even smarter investment. lockable aiming. Spotlight at almost any angle, with 358º horizontal rotation and a choice of 0º (downlight) to 35º angular adjustments. easy maintenance: Access the LED retrofit lamp, junction box, and transformer through the aperture. quiet apertures from our glareless reflectors. For seamless installation, add the Trim Flush Ring. optical accessories by Edison Price Lighting, including lenses, color filters, and screens. lockable aiming. Spotlight at almost any angle, with 358º horizontal rotation and 0º to 90° tilt. ​optical accessories by Edison Price Lighting or by Soraa Snap System. For a 5º narrow spot with higher lumen output, see the track mounted Artima/5 VNSP. Hides unattractive hardware above the ceiling. For mounting on a 4” octagonal mounting box. Offering the same features and benefits of the track-mounted fixtures (above). For a 5º narrow spot with higher lumen output, see the surface mounted Artima/5 VNSP-OBM.